EDWARDSVILLE — If you know Mike, tell him they’ve found his Frisbee. The Frisbee was among the things found in the tailpipe of the A-7E Corsair that sits on a pedestal in the Edwardsville Township Airplane Community Park. The jet, a U.S. Navy bomber that was first stationed on the USS Nimitz in 1975, was taken down Monday for repairs and renovations that are expected to take about a month and cost approximately $30,000. 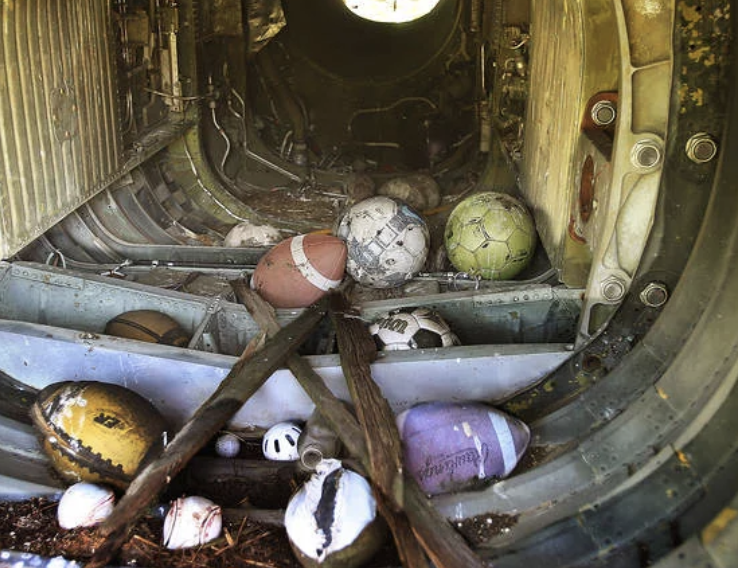 A collection of soccer balls, footballs, baseballs and a few tennis balls has also accumulated inside the plane over the past 26 years. On Monday, workers were trying to call Mike, who left his telephone number and an email address on the Frisbee. The plane, which has no engine, weapons systems or avionics, weighs about 10,000 pounds. Workers used a crane to lower it to the ground, and were securing it Monday morning. actual renovations, which is expected to take place over a four-to-six-week period. Township Supervisor Frank Miles said he hopes the work will be completed by July. The plane was placed in the park 26 years ago. Miles, who was working for the city of Edwardsville at the time, was there. “It’s a good day for the Airplane Park,” he said Monday, adding the plane was in need of rehabilitation. He also said a wire mesh would be placed on the tailpipe and air scoop to keep things, especially birds, out of the interior of the plane. He said bird droppings could react with the metal and weaken the plane’s superstructure. The township and Flight Deck Veterans Group were able to track down much of the history of the plane. According to the FDVG, it was originally part of VFA-82 Marauders until 1980, and then the aircraft served on the USS John F. Kennedy and the USS Saratoga, mostly in the Mediterranean Sea. It was installed in the park, officially the Supervisor Robert C. Stille Edwardsville Township Airplane Community Park, in 1991. A fence will be in place around the plane during the renovation, but people are encouraged to observe, according to Miles. The cost of the renovation is approximately $30,000, a combination of public and private funds. When the plane is back on its pylon, work will start on improvements to the nearby plaza, including opportunities for people to buy commemorative bricks.